What goes around comes around. Justice appears today to remind you that for every cause there is an effect. What we’ve done in the past will return to confront us eventually, whether for good or ill. Now that we’re approaching the New Year, it’s an excellent time to sit down and take stock of our past actions and see where we might have gone wrong. Then we can begin to attempt to make things right. In addition, we should work on letting go of our resentments towards others who have wronged us and caused us pain. As long as we allow ourselves to obsess about that pain, we are connected to the wrongdoers with emotional cords, allowing them to feed on our energy. Visualize your force of will transformed into a big sword and cut these cords with it! (You might have to cut them several times over a long period before they finally dissipate.) After you’ve done this, you’ll find that you’re refreshed and more powerful. 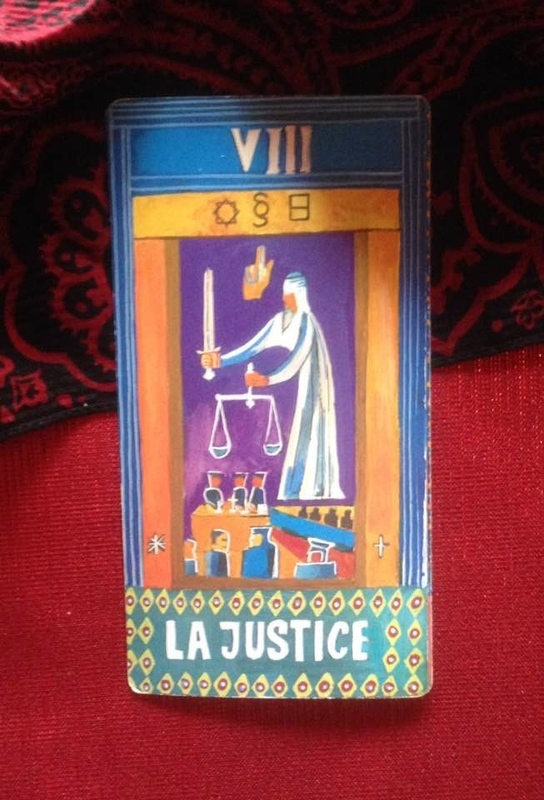 This card calls you to perform two tasks: 1) taking responsibility for wrongs you’ve committed in the past and making amends, and 2) cutting the cords that attach you to your past pain and grief due to being wronged by others. If you can focus on these tasks in these last couple of days before the New Year, you’ll go into 2019 with clarity of conscience and purpose.